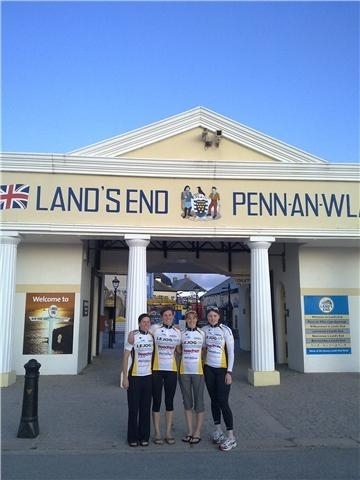 I just wanted to say a huge thank you for sponsoring myself, Emma, Jess and Parys on our epic journey from Land's End to John O'Groats. Thanks to your kindness and support we have managed to raise over £5000! This far out strips anything we had hoped for and it makes our cycling efforts feel even more worth it. Our journey started in gorgeous early morning sunlight on 7th August at 6.30am. We hunted round for the famous Land's End signpost but to no avail as it is taken down each night so had to make do with a photo on the wall to prove we'd been there. We were joined at Land's End by an amazing guy Rick Ryan who was just starting out to do the whole ride in a wheelchair. It kind of put our ride where we all took turns into perspective. He was aiming to break the world record of 10 days which he succeeded in a phenomenal 8 days 10 hours 9 minutes and 8 seconds. 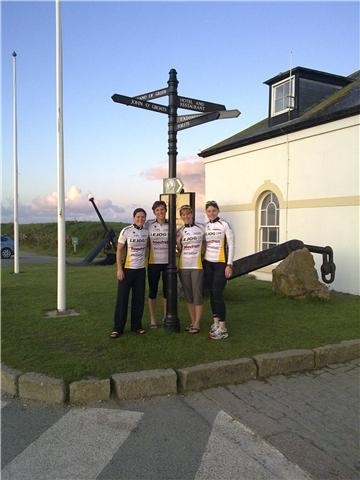 The team decided on the train to Cornwall to ride in one hour stints which meant we got three hours off at a time while the others were riding. Emma set off first and it was strange to wave her off and then jump in a van. 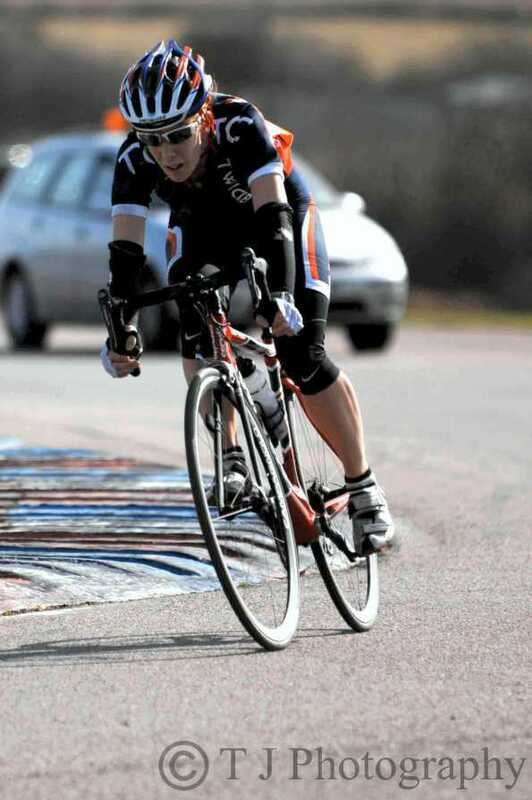 I was second up so didn't have much time to think about how far we really had to cycle before I was out on the bike. Ironically our first changeover, after an hour of cycling, was almost directly outside the hotel where we had spent the night in Hayle. We soon found out that Cornwall is ridiculously hilly. As we were taking the quickest route we cycled straight on the A30 through to Exeter and I'm not sure the road was ever flat. About 20 minutes into my first hour I got a puncture which we all hoped was not the shape of things to come especially as while I was standing by the road waiting for the van to arrive with a spare wheel the heavens opened. Luckily all our crossed fingers paid off and that was the only flat and only bit of rainfall (apart from near Perth when the van got wet but not Parys on the bike). Cycling for an hour each seemed to work pretty well as an hour was just short enough to feel that you weren't too tired by the end of it and three hours off was enough to get a good rest. Of course that wouldn't have been possible without the amazing help of our support crew, Stew, Gav, Sam, Cheryl and Tootsie who pretty much acted on our every beck and call, finding us toilets, stopping for tea, getting takeaway, buying up the whole of an M&S food store much to the despair of the cashier etc etc. We covered ground pretty quickly and by lunchtime we were in Exeter. By the time it was dark we were in Telford. At night we switched to a rota that gave us each four hours off at once, enough for a decent kip in our new minibus home decked with many a sleeping bag and pillow. Emma and I went first doing 10.30pm - 2.30am through the delights of Wigan and Warrington and surrounding towns. Swerving drunk people who stumbled into the ground made for good bike handling practice and Gav driving the van spotted more than one street fight. I think he was a bit nervous for us! By the time I woke up at 6am on Saturday, Jess and Parys had managed to get us to the Lake District. Waking up from my minibus bed looking out into the hills with lambs peering through the window and seeing Jess struggling her way up Shap Fell, the longest climb on our ride is something I won't forget in a hurry. Much to all of our surprise after 28 hours we were in Scotland. We were going far quicker than any of had imagined. I don't think any of the cyclists dared believe that it was going that well. Although I had never realised that Scotland was such a long country! As we carried on through the stunning Scottish countryside we soon detected a theme to our riding. Parys got all the money shots, cycling through sunset and sunrise, over the Scottish border, through Gretna Green - Jess got the big bridges through Scotland, The Forth bridge was particularly windy - Emma seemed to have all the uphills and never the down hills and I had all the towns and cities to navigate through, Exeter, Bristol, Wocester, Kidderminster, Warrington, Wigan, Penrith, Carlise, Penrith (some with more success than others). 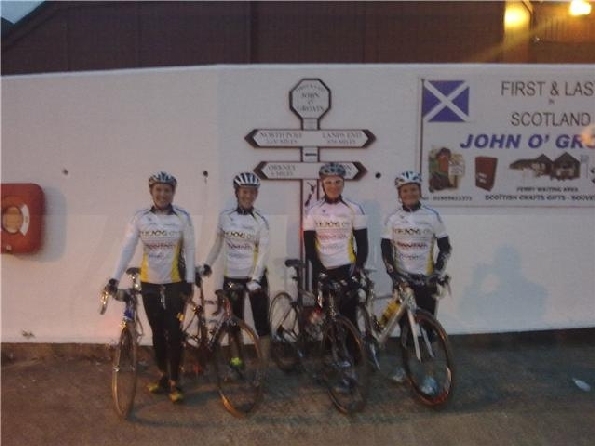 After 46 hours 16 minutes and 26 seconds we finally rolled into John O'Groats. Emma, Parys and I joined Jess on the final 5 miles into the town. At 4.45am we had arrived far earlier than we thought but still managed to to have a welcoming committee, a family playing tennis by the harbour in the dark (we never did work out why they were there). Very tired, very smelly but with big smiles we posed for photos before collapsing in the minibus for a well deserved kip. I have to say that I'm bowled over by how much I enjoyed doing the LEJOG challenge. Everyone was in such good spirits and the emphasis seemed to not only be on cycling fast but enjoying ourselves. Even our sweepstake on who would loose their temper first was null and void. I think it's fair to say that we've all experienced a little Lejog withdrawal since but it's given extra fuel to our plans for the next crazy challenge.